With the intention to provide our prestigious clients with unmatched distinct range products we are offering an impeccable collection of Pure Silk Roman Blinds. These roman blinds are fabricated from the pure silk. We assure the quality of the offered roman blinds as post manufacturing these underwent through the severe quality check under the surveillance of dedicated inspection team. Founded in 2014, Zappy Cart is one of the leading Manufacturers and Exporter of Pure Silk Curtains, Faux Silk Curtains and Embroidery Curtains. All these curtains are fabricated utilizing the optimum quality of textile under the guidance of extremely talented professionals, who have rich industry proficiency. Our fabrication unit is entrenched with sophisticated machine to fabricate these curtains as per market demand. 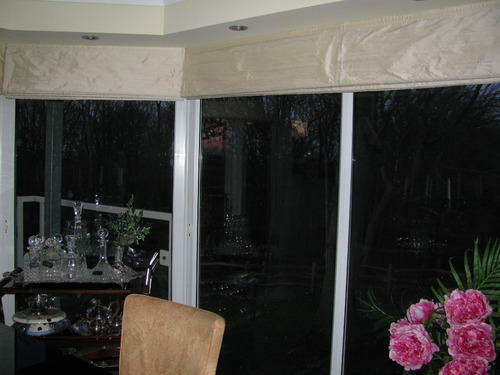 In addition, we present these curtains in different patterns that meet on clients demand. These curtains are extremely praised in market owing to their eye-catchy look, long-lasting nature, stylish look, colorfastness, shrink resistance, and low rate.